The low-carb diet wasn't designed specifically for people with anemia. 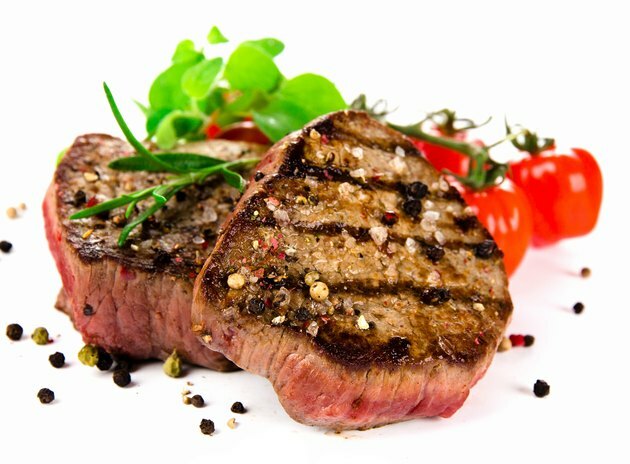 But the meat-heavy plan may be a good way to boost iron levels for those diagnosed with iron-deficiency anemia who also want to lose weight. However, as a medical condition with a number of different causes, including deficiencies in vitamin B-12 or folate, it may not be the best fit for all. If you've been diagnosed with anemia, consult your doctor to discuss the underlying cause -- and how to treat it -- before you switch to a low-carb diet. Anemia is a medical condition in which your body doesn't have enough red blood cells. Although diet isn't the only cause, not eating enough foods rich in iron, vitamin B-12 or folate can lead to a decrease in production of red blood cells. Upping your intake of animal meat, tofu and green leafy veggies such as spinach boosts the amount of iron in your diet and is part of the treatment diet for anemia. These foods also make up the basis of the low-carb diet. To get more iron on your low-carb diet, include foods such as red meat, poultry, seafood, tofu, spinach or eggs at most meals. Vitamin C improves iron absorption. Most fruits and veggies are a source of vitamin C, but those especially rich in the vitamin and low in carbs include peppers, tomatoes, broccoli, Brussels sprouts, cauliflower and strawberries. How about a little steak and eggs for breakfast on your low-carb diet? Add 1/2 cup of green peppers and 2 tablespoons of onions for flavor and vitamin C. This low-carb breakfast has only 4 grams of carbs. Or make an omelet and stuff it with 1/2 cup of cooked spinach -- particularly rich in both iron and vitamin C -- chopped ham and 1 ounce of cheddar cheese for 2 grams of carbs. Depending on how many eggs you use to make your omelet, this breakfast meal may meet more than 30 percent of the daily value for iron. For a low-carb take on hash with 8 grams of carbs, saute ground turkey with 2 tablespoons of onion and 1/2 cup each of diced turnips, diced green peppers and diced red peppers. Serve with a fried egg to add a little more iron to the meal. For a vegetarian-friendly meal, soak cubed tofu in a low-carb Asian marinade made with tamari sauce, soy sauce, ginger and garlic. A 6-ounce serving has 5 grams of carbs and meets more than 16 percent of the daily value for iron. Serve with 1/2 cup of kale sauteed in olive oil and garlic for another 2 grams of carbs. Make a vitamin C- and iron-rich salad using 2 cups of spinach topped with 1/2 cup of sliced strawberries, grilled chicken, crumbled bacon and 2 tablespoons of ranch dressing. This lunch has 7 grams of carbs. Or, try canned tuna mixed with mayo and 1 stalk of chopped celery stuffed into a medium tomato for a lunch with 6 grams of carbs. Finish off your day with more iron-rich foods at dinnertime. Toss 1 cup of cooked spaghetti squash with five sliced cherry tomatoes and top with low-carb meatballs for a 12-gram-carb dinner. Or, get more iron from turkey burgers topped with a slice of Swiss cheese, sliced tomatoes and 1 cup of garlic-roasted mashed cauliflower for a 6-gram low-carb meal. Beef is one of the best sources of iron. Grill it and serve with 2 cups of lettuce topped with 1/2 cup of sliced cucumber, a sliced hard-cooked egg, chopped bacon and 2 tablespoons of Caesar dressing. This iron-rich dinner has 5 grams of carbs and meets 17 percent of the daily value for iron. National Heart, Lung and Blood Institute: What Is Anemia? How Does B12 Deficiency Cause Iron-Deficiency Anemia?